It might seem like we just got through winter but spring has already sprung and the warm weather will be here before we know it. Now is the time to reinstall your window A/C unit so it’s ready to go when those warmer days do arrive. 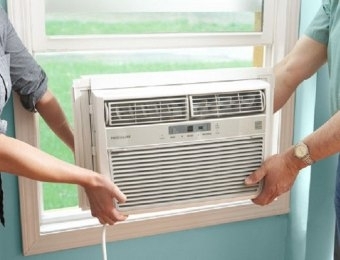 It’s about time to reinstall your Window A/C unit(s). Hot temps are right around the corner. Some homeowners employ handymen or HVAC reps to properly install their window units as they can be quite heavy. For those of you who usually do this yourself, generally the steps to take are the following: 1) Pull out the unit and clean/vacuum any dust that may have accumulated during storage on both the exterior and interior of the unit. 2) If you have previously taken them off, reinstall the side filler panels that will fill in the window box to the left and right of the unit. 3) Set the unit in the window, making sure the bottom rail is against the outside edge of the window sill. 4) Next, lower the window sash back down so that it touches the top of the unit behind its top rail. 5) Expand the side panels to the left and right so that they touch the sides of the window casing and attach them according to the instructions in your user manual. 6) Cut a window seal to the width of the window and insert it between the upper and lower window sashes to keep warm air from seeping into the room behind the unit. Use weather seal to close any other gaps.